Do you hate using a tripod? Do you find it too cumbersome to use, heavy, and do you think it stands in the way of creative photography? You are not the only one. I meet a lot of photographers during my workshops and masterclasses that find the tripod a necessary evil. And most of the time, it is because they are using it the wrong way. I love using a tripod. 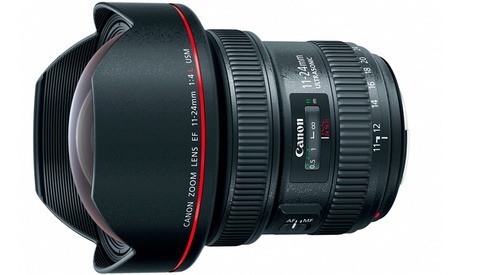 It is a solid base from which you can shoot a landscape without any haste. It can give peace and quiet and let you enjoy the landscape even more. You place your camera on top of the tripod and sit back and relax, not only to look at the landscape but actually see the landscape. But you have to be able to set up the tripod in an efficient way and not struggle with it. 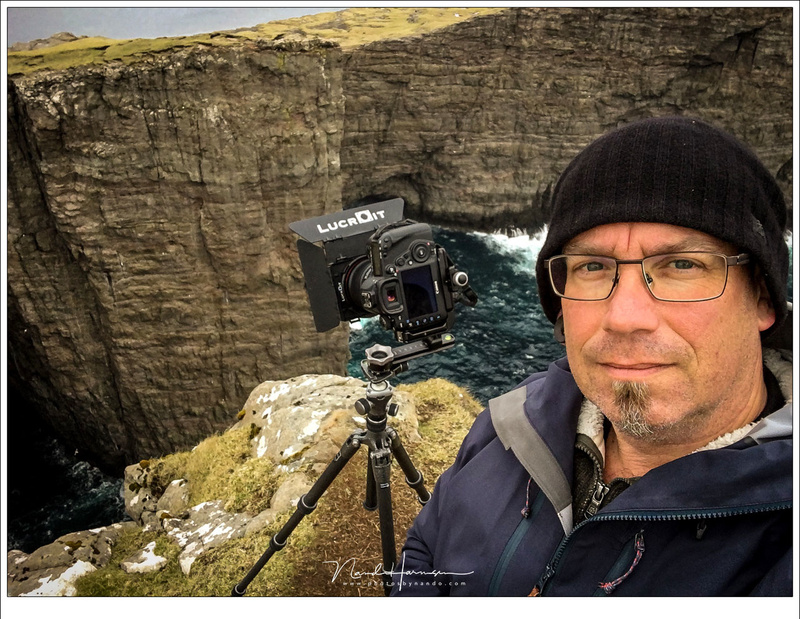 One of the rare selfies I made while photographing an amazing landscape from tripod. It is my way of enjoying the surroundings and eventually taking the photo I like. Or more than one, of course. The use of a tripod is not that difficult. You don’t need a manual for that. Just extend the legs of the tripod, placing it firm on the ground, and put you camera on top. That’s it. A lot of photographers always extend the legs to the maximum height; they chose their tripod probably because they can extend it to the same length as their height, making them able to stand upright. You bought a tripod that is the same height as you so you can use it without crouching. But it isn't always the height for the best composition. After you extend the tripod to the maximum length and place your camera on top, you might find the composition not to your liking. So, you look at the landscape again and you decide to try a lower angle. So, what do you do? You take the camera from the tripod, make all three legs shorter, and connect the camera again. If you find the maximum height to be wrong, you can lower the tripod. Disconnect the camera to make it easier reducing the length of the legs, and it is safer. When you look at the screen or through the viewfinder, you start doubting. This height does not show what you had in mind. Perhaps even a lower angle will be better, and you decide to take it as low as possible. So again, you take your camera from the tripod, shorten all three legs, and connect your camera. The best composition is perhaps even lower. So, you need to change the length of the legs a second time. After you looked through the viewfinder, you see it is too low. Perhaps all details and lines in the landscape become invisible because of that low position. So, you curse a bit and find you need a higher viewpoint after all. So, you disconnect the camera, extend the legs, connect the camera... again. Well, the lowest angle did not seem to work. Higher is better. So, change the length of the legs again. By now, you probably are grumbling at the tripod. Thinking you finally reached the height you need, you look through the viewfinder and see it is still not too your liking. It needs to be just a little lower. So, it starts all over again; disconnecting the camera, shortening the tripod legs, all three of them, and connecting the camera one more time. By now, you are really cursing the use of the tripod, especially because you found out it is the height you already tried before. Unfortunately, it was a bit too high and again you need to lower the tripod. At this time, I am sure you are cursing the use of a tripod. But at last, you have the height you want. Does this sound familiar? 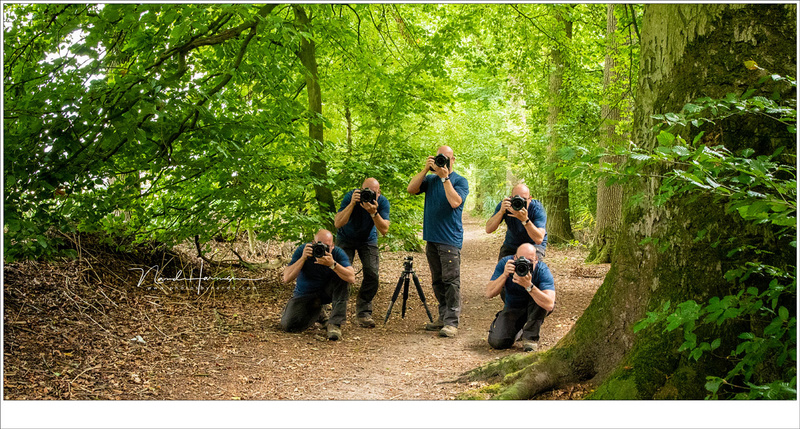 Truth is, a lot of photographers work like this. Can you understand how terrible it feels when you eventually want to take even another composition? Perhaps playing with the height has to start all over again. Often, it is decided not to change the height of the tripod a second time, just because it is too much trouble, and the picture is taken even if the height is not exactly to their liking. 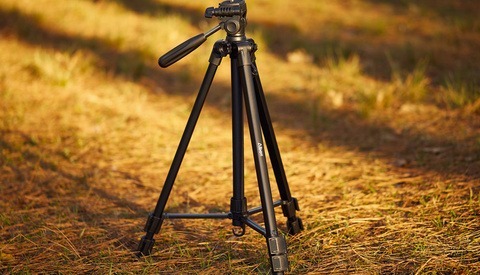 Some even leave their camera connected to the tripod when changing height, making it top heavy and thus more difficult to change the length of the legs, but also posing a risk if the camera is not connected firmly enough. I have seen cameras fall because of this. It is understandable that working with a tripod this way can be found cumbersome. But there is an easier way. When you find a location to your liking, it is best to lay your tripod aside. Don’t bother extending the legs or setting it up. Just place it somewhere safe, and for the moment, forget about it. Next, you need to establish the wanted composition. This means you have to look through the camera and try different positions, heights and standpoints. You even can play around with your focal length to get the best composition. 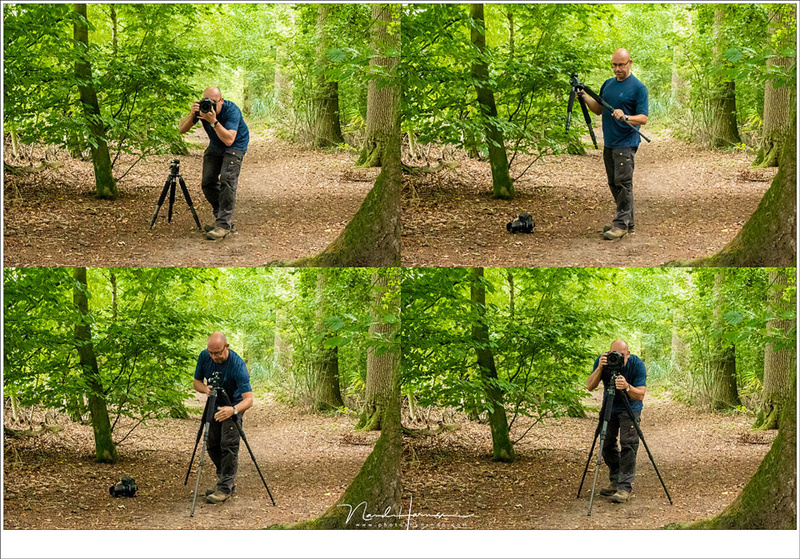 I call this the tripod dance of the photographer; look through the viewfinder high and low, left and right, forward or back. Do this until you find the exact spot where you want to have your camera. When you have established your position and height, you have to remember this. Then, and only then, you have to grab your tripod and extend the legs to the height you have chosen. At last, connect the camera on top of your tripod and you're done. Now that you know where you want your camera and at what height, you can extend the tripod legs to the right length in one go. Easy. Working with a tripod becomes a lot easier this way, and also much more fun to do. It even helps you to look at the landscape and really see it. Of course, you can fine-tune the position and height when necessary. If you want another composition after the first one. You have to start all over again. Just disconnect the camera, leave the tripod behind, and start the tripod dance all over again. 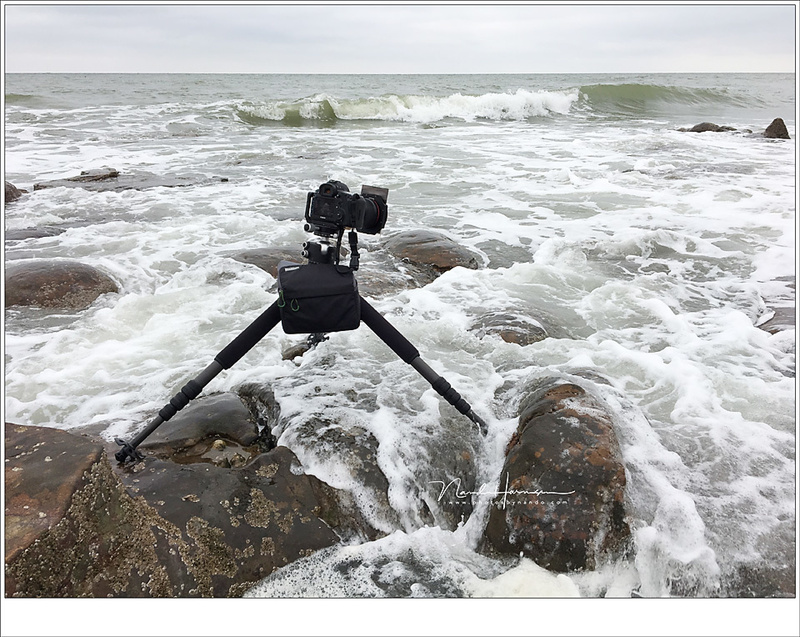 When you have established the next composition, you can grab the tripod, change its height when necessary, and connect the camera. It is easy, quick, and lots of fun. The method of determining the right spot and height through the tripod dance of the photographer will make it easier and safer to place your tripod on difficult spots. You should give it a try. Do you use your tripod this way, or do you have another good way of setting up a tripod? Please share it in a comment. I have never seen anyone do it the "difficult way." Ergo, the only right way to use a tripod is the second way. *In some genres, the use of a tripod may be a given, as may be the other parameters, yet still, choosing the perspective is the first non-given variable after choosing the subject. Who takes the camera off the tripod every time they adjust it? That’s insane! After reading the article i realized that hopefully i'm doing the easy way. Good to know for those they weren't. Having worker primarily as a photojournalist I seldom used a tripod. 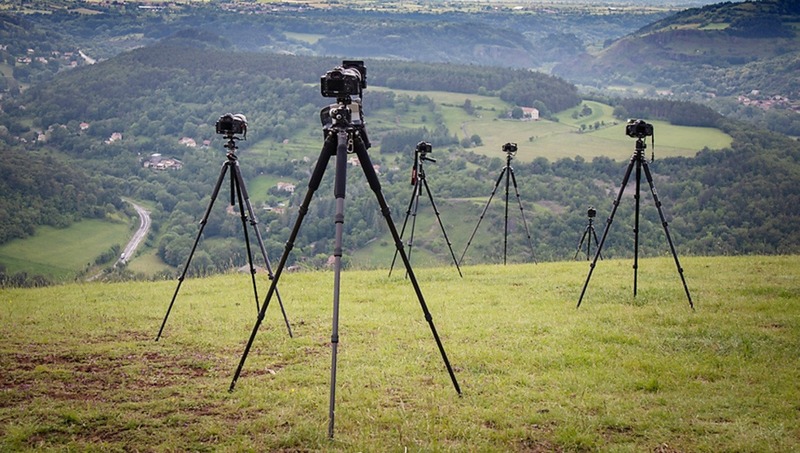 Now that I am concentrating upon landscape and wildlife photography tripods are a virtual necessity. Happily I worked as a land surveyor for many years in my youth so I have a great deal of experience with tripods in general. That said I totally agree that you should first have a good idea how you intend to compose your image before setting up your tripod. No matter how good you are at reconfiguring the tripod's legs once you set it up the tendency is towards "That's good enough." One feature I've personally found to be useful is a center column as this allows those final height micro-adjustments so often needed. I know that many folks believe that center columns lead to increased instability but that's only when using heavy telephoto lenses and/or when you extend the center column more than a few inches.